Boost Your Vitamin C this Winter, Thanks to This Delicious Fruit and WIN! My kids are watermelon/apple/pear/banana kind of folk. Always have been. And, I assumed, always would be. I can’t even mention words like “avocado” and “honeydew” without being met with an eye roll or a “yuck”. But recently the fruit quartet gained a new member – the sweet red Australian papaya. And I honestly can’t be more excited to welcome something different to the fruit bowl! Like many mums, I wasn’t that familiar with the papaya. Or the papaw, which I assumed was the same thing (nope, it’s not). I knew papaya was a tropical fruit but I always stayed away from it for fear my kids would dismiss it for being ‘weird’. 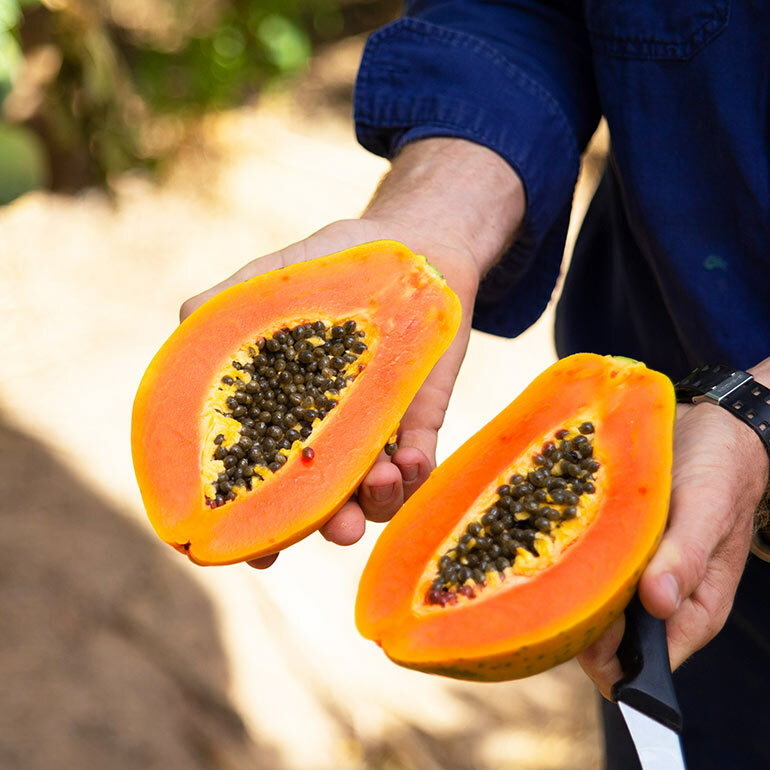 Thanks to a recent trip to a papaya farm in Far North Queensland, I quickly became an expert on all things papaya and discovered just what this sweet fruit brings to the table. Full of fruity goodness. Each serve provides all your vitamin C needs, almost a third of vitamin A needs, and more than a quarter of folate needs. They are also rich in fibre and help with iron absorbtion. Great for immunity, gut health, weight management and skin repair. Papayas are low in kilojoules, high in both soluble and insoluble fibre and have a moderate glycaemic level which helps keep you feeling fuller for longer. Glowing with goodness. The antioxidants, including beta-carotene and vitamin C, can help give your skin a natural glow and even help repair your skin. Share the Papaya Love! 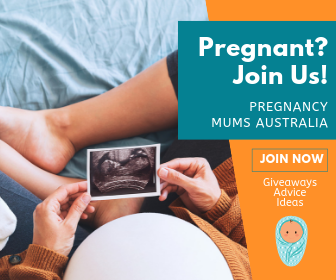 Simply scroll down to the bottom of the post and tell us if you’ve tried papaya before to be in the running to win one of two $50 Visa Gift Cards. Papaw or Papaya. What’s the diff? But what about the papaw? Isn’t this the same thing as papaya? Turns out, no! You see, there are two main varieties of papaya – the red papaya and the yellow papaw. 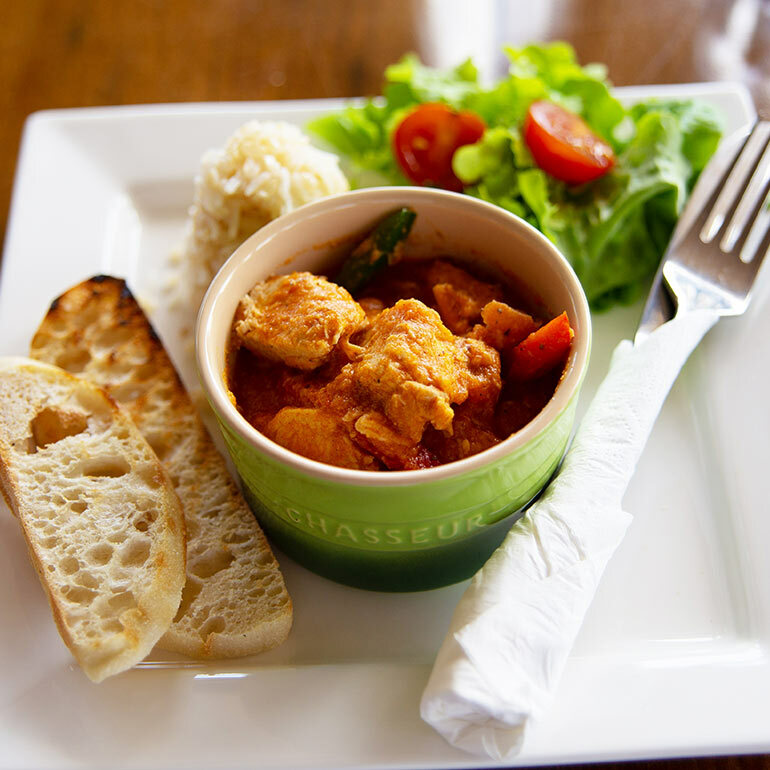 Both are grown in Australia and both are sold in supermarkets, green grocers and independent retailers. The papaw (the yellow one above) is the larger round fruit you see on the shelves. It has yellow flesh and a less sweet flavour. The papaya is the pear shaped fruit. It has orange to red flesh, and often has little brown freckles on the skin. It’s the sweeter of the two and also tends to be more popular, especially for kiddies. So there you go. Our ‘a-ha’ moment in Tropical Fruit 101. Now that that’s cleared up, let’s head to the farm! 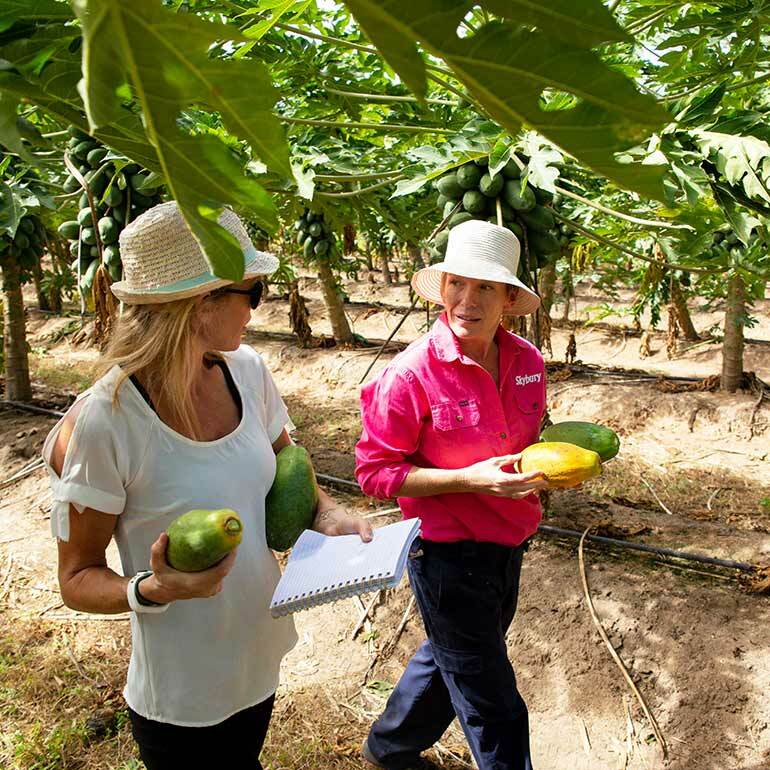 There are more than 80 different papaya farms in Australia (most are in Far North Queensland, with other farms in Northern Territory and Western Australia) but Skybury Farm is one of the largest. Sprawling over 400 acres some 75 kilometres from sunny Cairns, it’s owned and operated by the MacLaughlin family. Candy (in the pretty pink shirt above), her husband Paul, brother Mark, and parents Marion and Ian, all handle a different element of the farming process. Even the kids get involved, when they are not in school. 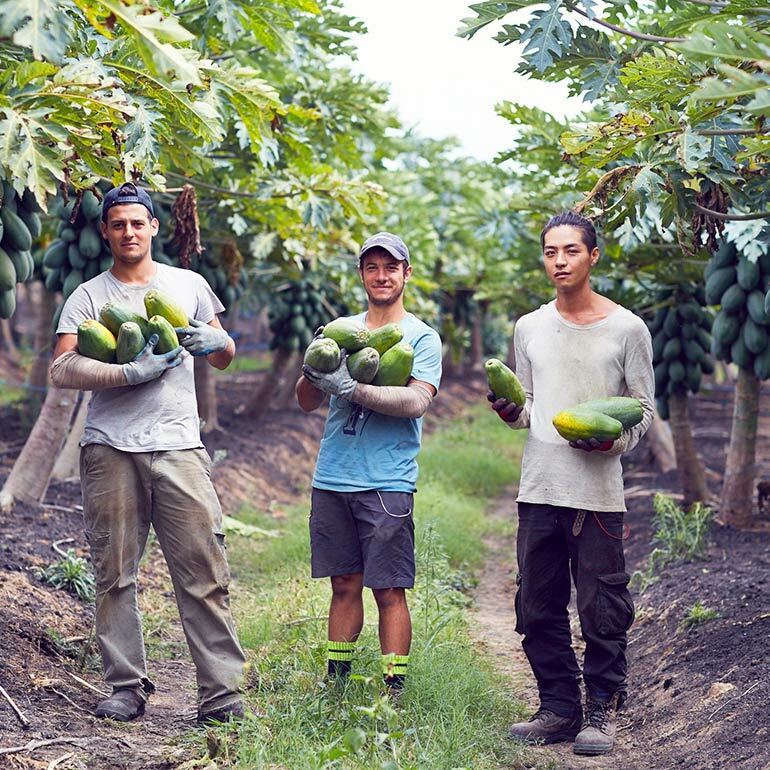 There is a lot of love on the farm and a lot of this love goes into their papayas. From talking to the MacLaughlins, it’s clear that this isn’t just a business. It’s a passion that grows from thirty years of farming experience. 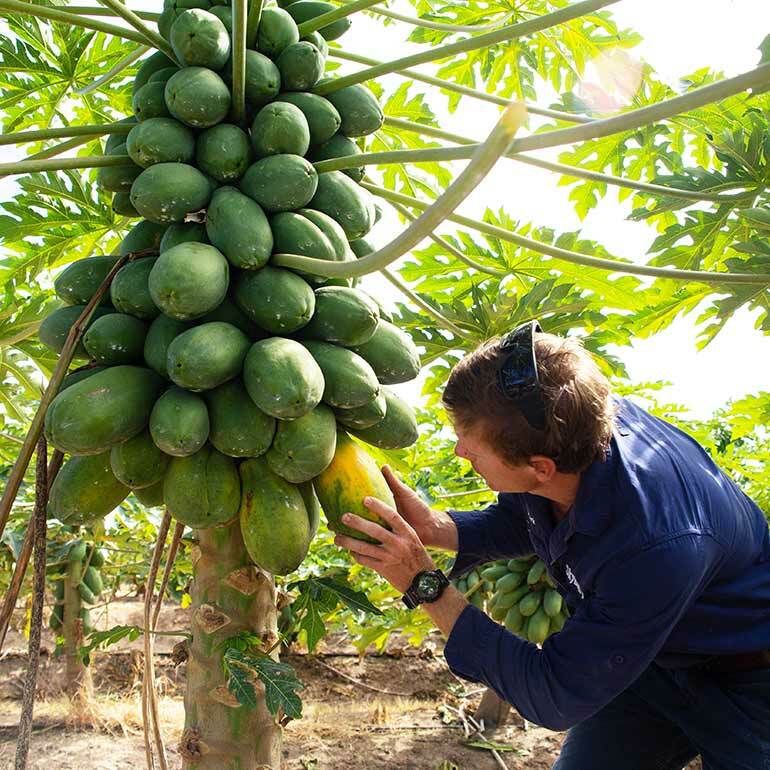 It’s their mission to ensure each and every papaya they grow is absolutely perfect – a sentiment shared by all Aussie papaya growers. 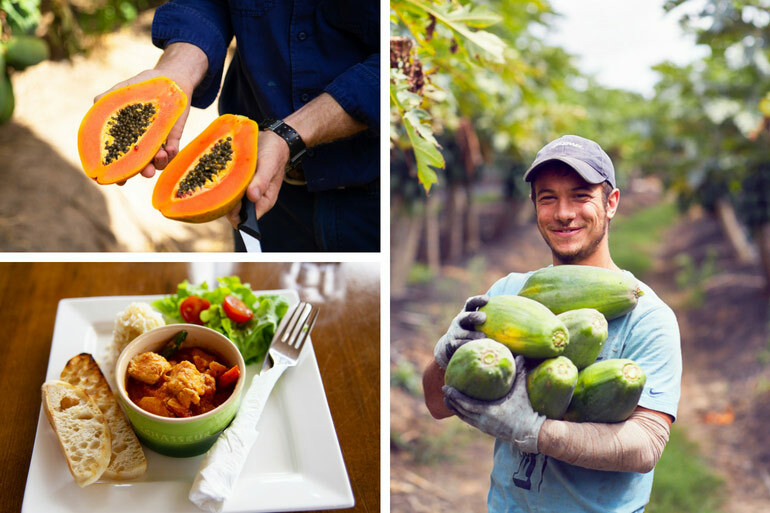 But just how does the Australian papaya get from the farm to your fruit bowl? It’s actually an insanely cool process, one that is quite similar to our own baby’s development. Minus the whole “being pregnant and having to push the baby out of your body” part. Each papaya starts off as an itty bitty baby plant, cloned from T3, the super-dad of papaya plants. It lives in a lab for three months, then into a humidity crib (yes, like an incubator), then an indoor nursery for a month, followed by an exit nursery for another month. Then it’s out into the big bad world – the paddock. 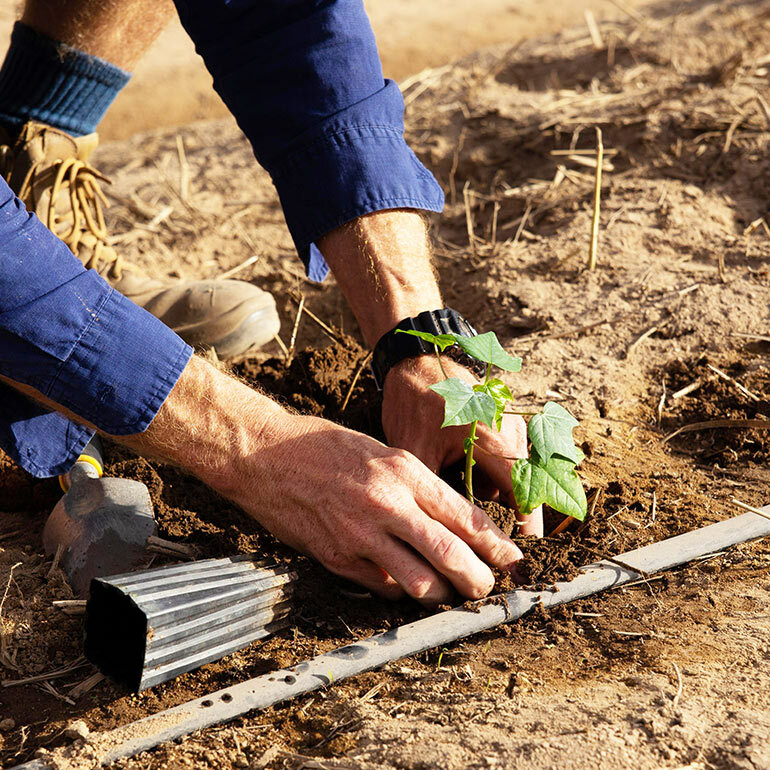 It takes each plant about four months to grow big enough to sprout fruit and another four months before the fruit is ready to be picked. Once the papaya tree is mature, it works its little trunk off! There are no ‘seasons’ when it comes to the papaya tree. They keep growing and producing fruit year round with peaks in autumn and spring. 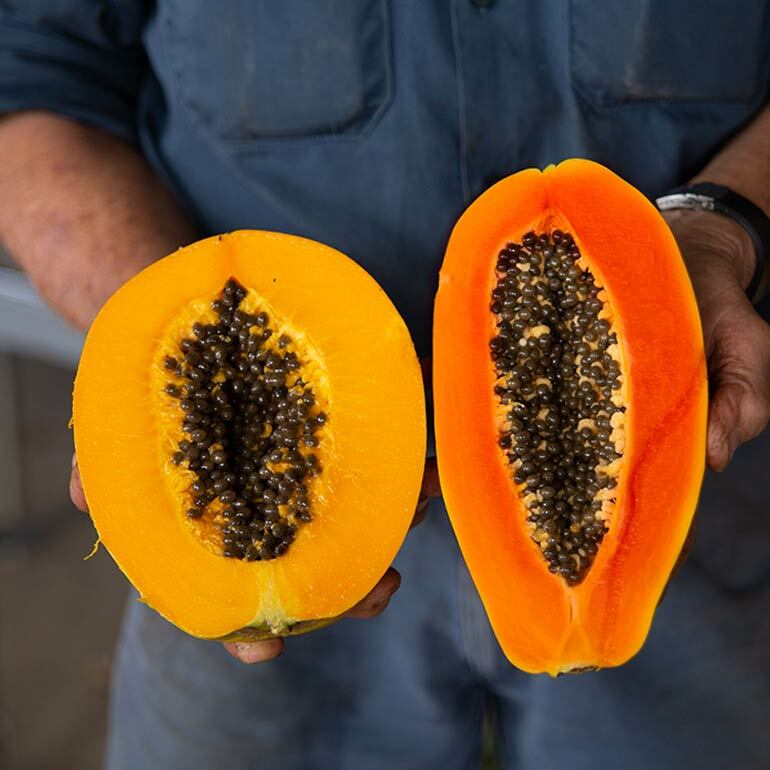 According to farmer, Gerard Kath, who owns Lecker Farming – Skybury’s neighbouring farm, “Papaya is one of the few fruits that continuously flowers and produces fruit. 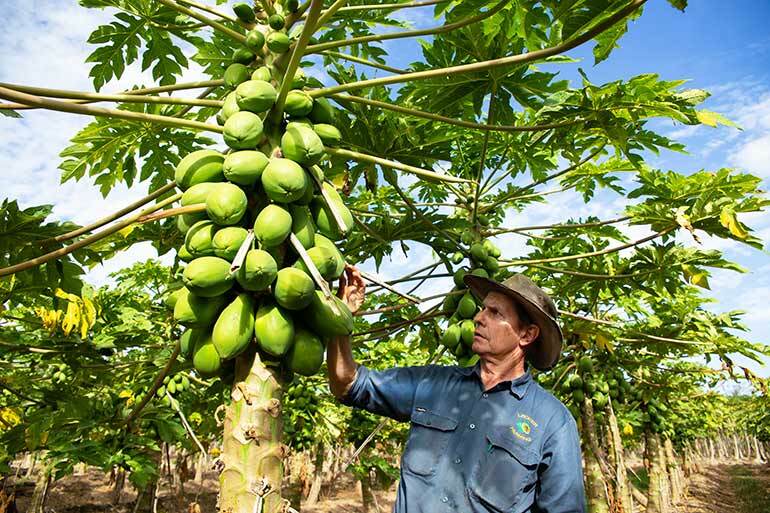 Each papaya tree is picked once a week, the new fruit sent to the packing shed. 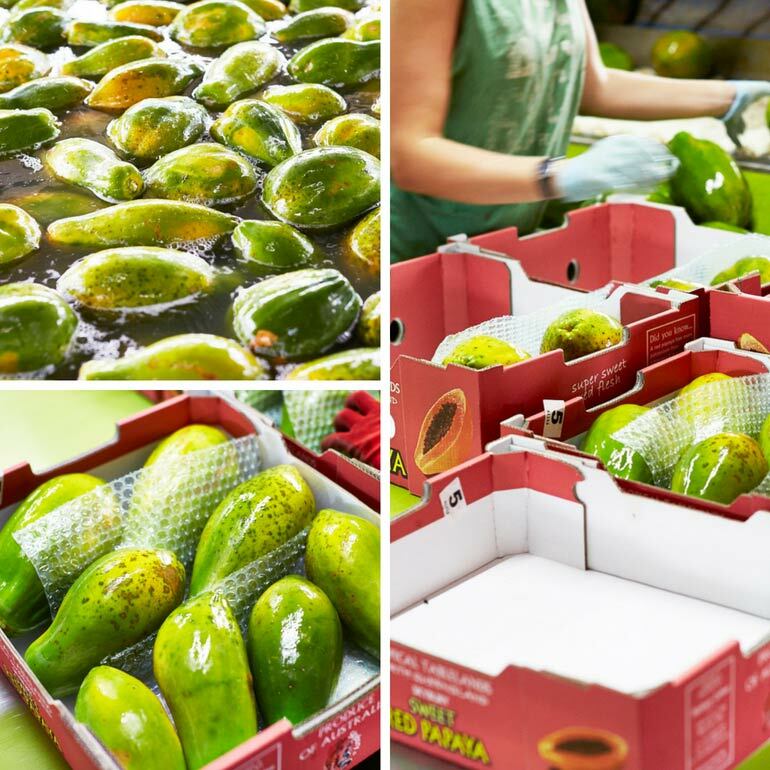 The team of packers wash, check and sort the papayas before boxing them up and sending them on a truck to a distribution centre. They are then checked again before arriving at their final destination – the shops or markets. 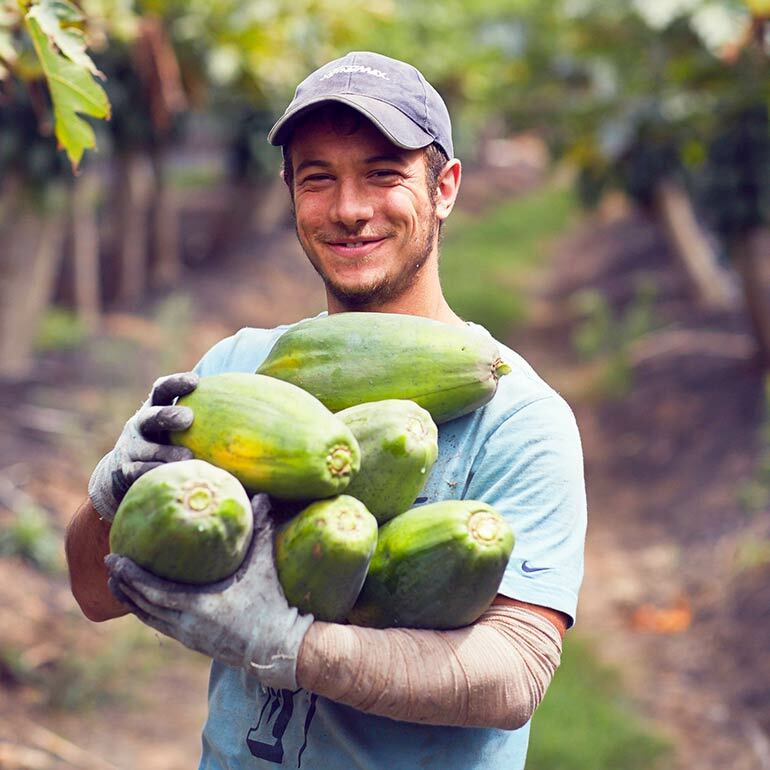 The whole process, from picking the fruit off the tree to finding it at your local supermarket or greengrocers takes about a week. If you are looking to add papaya to the mix, then it’s important to choose wisely. The thing about papaya is that they don’t always look pretty. The fruit is ready to eat if it’s soft and gives slightly under pressure. These little black spots or freckles, actually indicate sweetness and are a plus, especially if your kids like sweeter fruits. Ripen your papaya in a fruit bowl before moving it to the fridge. After cutting it, you can store it in the fridge for around two days. Or, freeze the excess for smoothies later on. Check out the video below on how to prepare papaya. 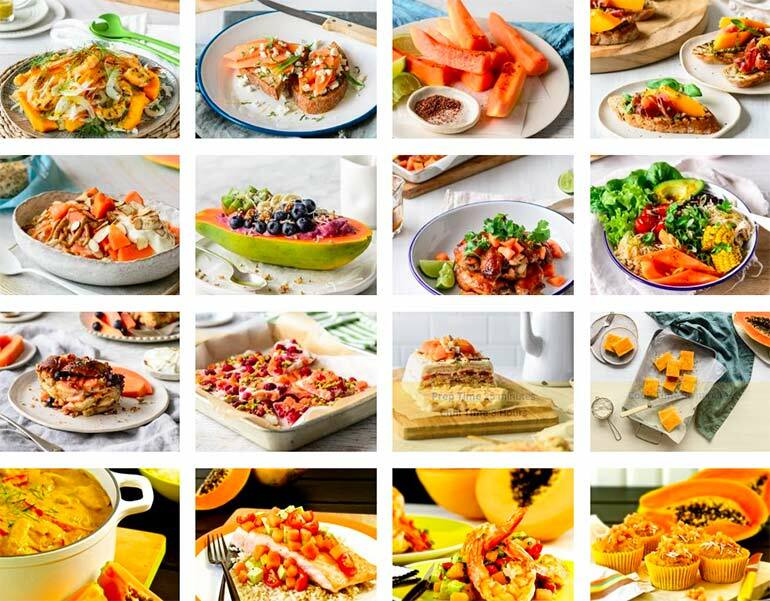 Have a look over at Australian Papaya for heaps of different papaya recipes to try. Not all fruits are created equal. And my day on the farm confirms that the papaya is as Aussie as they come. Grown in Australia, planted and picked by Aussie families and packed with heaps of nutritional benefits, we hope your kids learn to love the papaya as much as mine have! The next time you head to the supermarket, green grocer, independent retailer or farmer’s market, consider trying something new. We promise, you won’t be disappointed! We’re curious – who has tried papaya before? And who loves it? 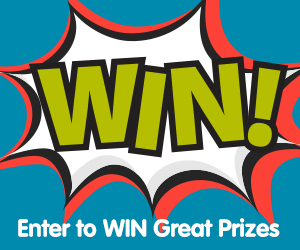 Let us know in the form below for your chance to win one of two $50 Visa Gift Cards. Spend it on delicious ingredients to make your own papaya dish … or anything else that tickles your fancy. I grow both paw paw and papaya. I love the smell of papaya and makes a good base for fruit cake. Very easy to grow and the kids love the giant leaves. I love papaya, for breakfast its all I desire! I LOVE Papaya and Paw Paw! My husband tried papaya for the first time in his 48 years on our recent holiday to Fiji and claimed it was better than the ones we get here in QLD; thanks to you guys I can now convince him that what I tend to buy here is pawpaw! Papaya is truly a wonderful fruit with rich vitamins and antioxidants. I love to use papaya to create delicious smoothies with coconut milk or cream milk. It is a famous summer drink in most Asia countries. Young papaya has crisp taste and perfect flavours for mouthwatering Sam Tum Thai : Green Papaya Salad .Today’s beauty industries have found that papaya has incredible healing power to make amazing beauty products. There has millions reasons to love this simple fruit. More than than I had ever realised. My Mum would always make us green papaya salad. So refreshing. I never knew the difference. We’ve had pawpaw and I tell ya… it didn’t go down great with the kids. We’ll have to try papaya to see if they like it more!! Yes! Papaya is much nicer than Pawpaw and great in salads to be a bit fancy. Papaya is delicious; a wonderful post & interesting read, thanks so much – I love the recipe idea’s to very inspirational and creative. I also always though pawpaw and papaya were the same thing and not really liking pawpaw I wouldn’t have tried the papaya. However, after reading this article I want to go to the store first thing in the morning to try the red papaya and if I like it, i’m certainly going to try to grow one myself. I discovered papaya about ten years ago in Vanuatu. Now I am the greatest fan! Love Love Love it!